Found one file extension association related to Microsoft PhotoDraw and 1 file format developed specifically for use with Microsoft PhotoDraw. Microsoft PhotoDraw combines photo-editing and drawing tools in one streamlined application that makes it easy to create professional-looking graphics for Web sites and printed material. It works seamlessly with other Microsoft Office applications, and includes more than 20,000 customizable images and clip art. Like other Office products, PhotoDraw includes accessibility features that help people with disabilities use this product more easily and effectively. 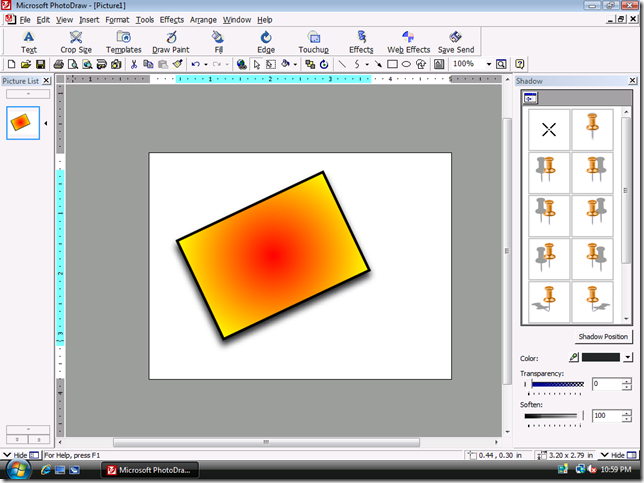 Following is a summary of the accessibility features in PhotoDraw 2000. PhotoDraw 2000 includes keyboard access to all features, either via access keys or the TAB key, in order to set focus to controls and execute commands. By default, PhotoDraw 2000 uses the same display settings as Office 97 and Office 2000. You can change the default display settings by choosing options in the Windows Control Panel. ToolTips appear on most PhotoDraw graphical controls and unlabeled controls. For example, when the pointer hovers over a picture button or any unlabeled galleries, a ToolTip appears. Context-sensitive Help can also be displayed for the majority of controls. Improvements to Clip Gallery and the Microsoft Help system in PhotoDraw, as well as other Office 2000 products, provide the following: search support in Clip Gallery, keyboard support for Clip Gallery, clip Gallery screen-reader support, large clip previews in Clip Gallery. The Microsoft PhotoDraw software seems to be old or discontinued. If you need more information please contact the developers of Microsoft PhotoDraw (Microsoft Corporation), or check out their product website.